Oogachaga has announced that from 1 October 2014, they will be starting a new hotline service called “WOW” which stands for “Women on Wednesdays”, specifically for female members of the LGBT community. 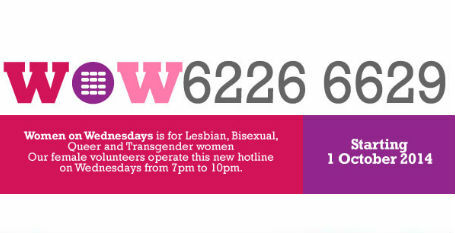 WOW is a service for women who identify as lesbian, bisexual or queer, and runs on Wednesday evenings from 7pm – 10pm. All calls will be handled by trained women hotliners. Callers can dial the number 6226 6629 if they wish to have a listening ear, to seek emotional support for their issues, or get connected to community resources. Since April this year, Oogachaga has been preparing its women volunteers as part of a structured training programme to equip them with the necessary skills to attend to callers who may present a range of issues, including relationship difficulties, questions about sexuality, sexual health and violence. Since 2006, Oogachaga has been running Singapore’s first and only hotline for the LGBTQ community, called the OC Hotline [tel: 6226 2002]. The service continues to operate 4 days a week, and averages 20 – 30 calls per month, attending a range of issues. Additionally, a Whatsapp service is run alongside the hotline to offer greater convenience to callers. Oogachaga (OC) is a counselling and personal development organisation for lesbian, gay, bisexual, transgender and questioning (LGBTQ) individuals in Singapore. We are a non-profitable organisation under the umbrella of SPACES Counselling and Community Limited. SPACES (Registration No. 200402955N) in a company limited by guarantee with registered charity status in Singapore (Charity no. 01812).